We provide professional dry cleaning and finishing services on every fabric type, including beaded and sequined items. Wedding Dresses are our specialty. 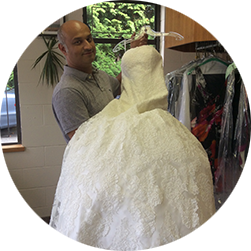 We have been cleaning and restoring Wedding Dresses for over 30 Years. Do you have an heirloom gown that you wish to have cleaned or altered to be worn again? We have the skills to restore aged fabrics, repair beading and lace and alter your dress to fit perfectly. You will be able to walk down the aisle with pride, wearing a piece of family history. The memories associated with a wedding gown are ones you will cherish your entire life and you will want to preserve your precious gown for years to come. We take extra care to meticulously clean and press your gown, then package it in a sealed acid-free preservation box so that it can be safely stored for many years.